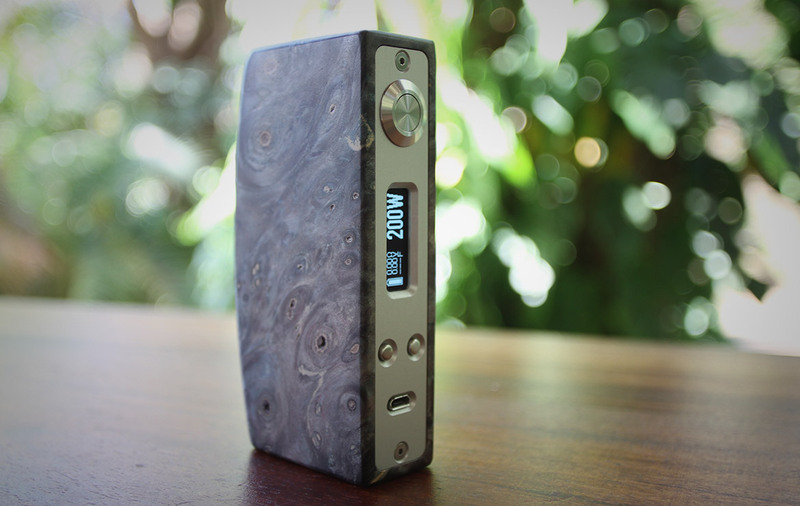 We were stoked to announce the buzz around Axis Vapes and their mission to create a more obtainable high-end DNA200 Mod. Well have they done it? Is it all it’s cracked up to be? Are they easy to get? Yes, Yes, and Yes! Lets talk the details, shall we? First and foremost Axis Vapes has killer service. This is an important ingredient in being successful in any business, let alone the Vape industry. We scored a mod on their first release and there was a mix up, two of us ordered the same mod. So what did they do? They got in touch immediately and offered us a couple new finish choices, we were set on blue and they didn’t have one ready yet but they let us pick a block and then did a great job getting it ready a couple days later. Keep in mind they had no idea we were going to review it or who we were, this is the level of service you can expect for everyone. Just stellar! Since our order we have kept a close eye on their releases to see if they could keep their promise of making it easy (or at least easier than most other high-end mods) to get, and we are happy to report they have done a great job. And as of Feb 19th they have stepped up to full production and are adding mods for sale on a somewhat daily basis. It’s a good idea to follow the company on Instagram, they announce releases on their feed. The Axis Vapes site is well thought out and gives a personalized feel to the order process. Each new Mod is showcased with several pics and its serial number, making it easy to get a great sense of what you will receive on delivery. The packaging and detail around shipping is stellar, they ship quick and you can rest assured your Mod will arrive in perfect condition. Okay so what about the Mod? How is it? Is it worth the $350-425 price tag? Well yes it is. The High-end market is weird, the mods function really no differently than one you can purchase in your local vape shop with the same chipset and battery specs. It’s about the materials, case design, and hand feel. So if you think about it, they are never going to be good value, but the emotional connection you have with them may make up for it. 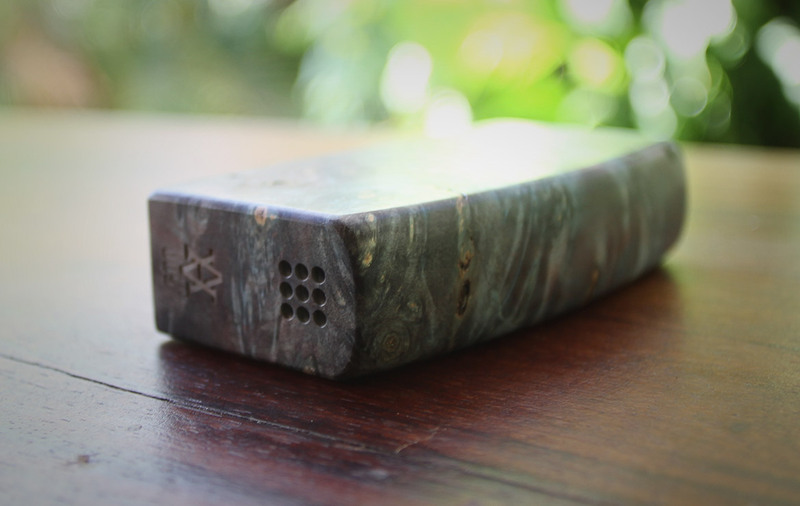 The M17 is beautiful crafted and finished, the wood is perfect, there are no surprises (you get the one you ordered), and thanks to the Evolve DNA 200 chipset it functions beautifully. The hand feel is quite good, smooth, curved perfectly, a little tall but the proportions are spot on for an average sized hand. The Wood is thick, there is no flex, it’s going to stand up very well. The sanding and polishing are again spotless. 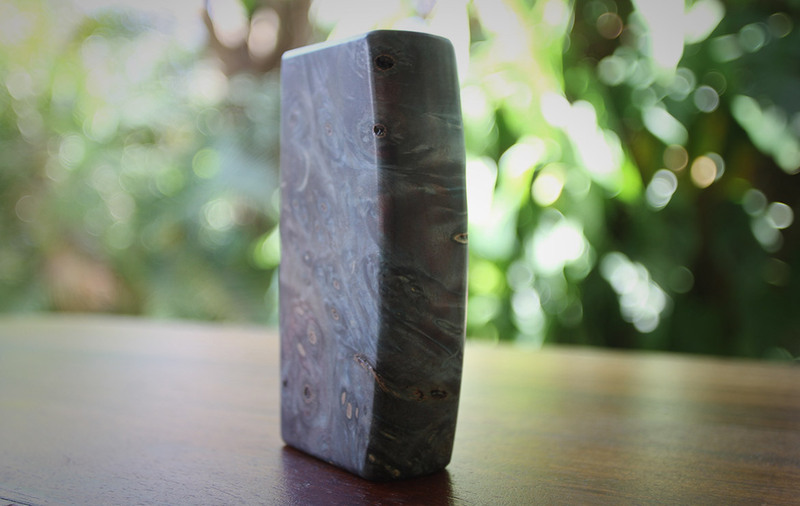 Axis has done a great job curating their wood block selection, there isn’t really an ugly M17 out there. 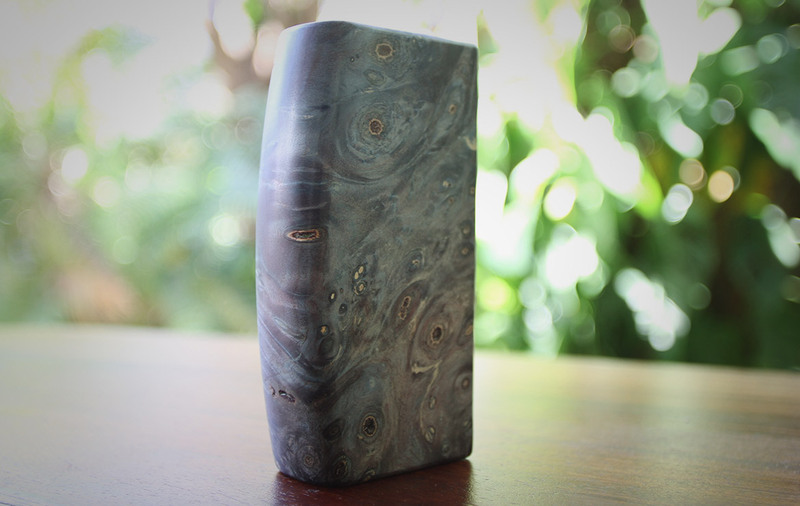 They come in 3 finishes, 1 colour dyed stabilized wood($350), 2 colour dyed stabilized($375), and soon an acrylic stabilized hybrid they are calling “Shokwood”($425). We aren’t positive but we think we scored a two colour, it’s blue with slight purple accents, but not sure how it qualifies. The fit and finish is pretty spotless, the tolerances around the aluminium faceplate are pretty much perfect.The Mitech fire button has the trademark clickiness with a short throw. The control buttons are stainless and match the fire button perfectly. Again everything looks to be very durable (we have only had it a couple weeks) with no signs of wear so far. The little details in the quality and positioning of the logo, serial number, and vent holes are flawless. You will find yourself staring at it frequently. A couple small gripes, one is the allen screw heads that secure the faceplate simply look cheap (their faces are rough and the colour of the material doesn’t really match with anything, making them stick out visually), and our unit has a bit of an issue with the level of protrusion on the up/down control buttons (they aren’t sticking out equally, the right button is about 1-2mm further into the faceplate, works perfectly, you just feel it). These are minor issues, but when you spend $350+ USD on a mod, you find yourself getting picky, for us it’s because we want to live with it a long time and so we want it perfect. All this said it’s still an awesome, awesome mod! Battery life is decent, it’s not really Axis Vapes problem, they have put in a more than average capacity LiPo battery. 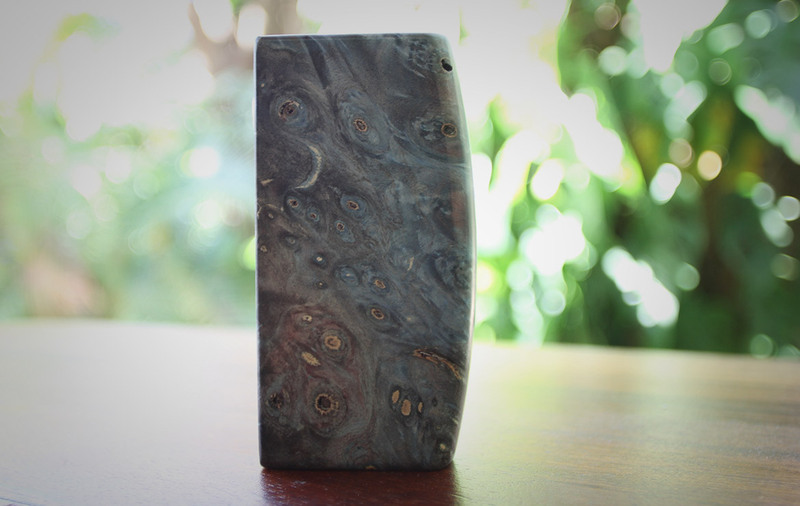 Most moders and manufacturers use 900 mAh, so the 1100 mAh is nice, it still won’t make the mod last all day. We find with all DNA200 LiPo setups that vaping anything over 25W at a chain vape level only last a max of 8hrs or so, you get a little more life jumping to 1100 or 1300 mAh, but not a ton more (maybe an real world hour per capacity). The good news is it charges pretty quick and if you are buying this mod you more than likely have another mod you can use while it juices up. The M17 feels great in the hand, it’s light, about the same weight at a Hobo X which is much smaller. The weight will surprise you, much lighter than you think. 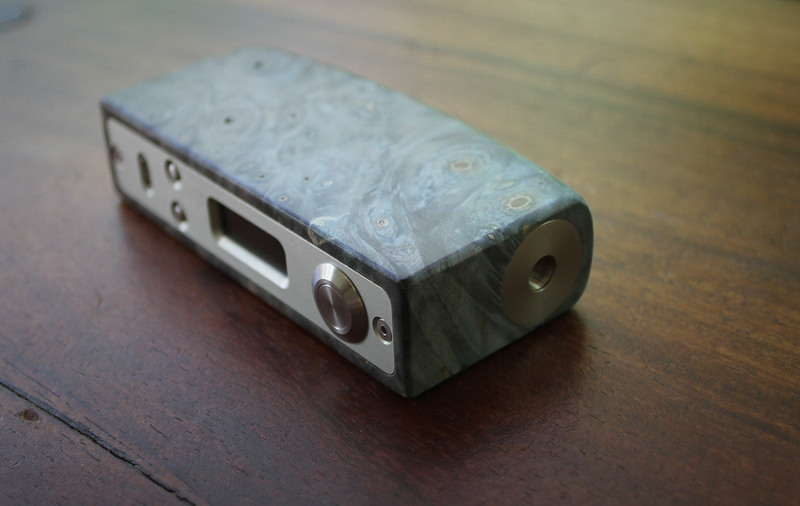 Everything about this mod feels high-end, Axis has delivered on their promise. It’s not affordable- but much better priced than many, many other mods of this level on the market. And you have a great chance of scoring one, unlike a lot of those other crazily priced mods. This whole side of the market is about preference and style, you need to love the aesthetic and design for it to be worth it for you. 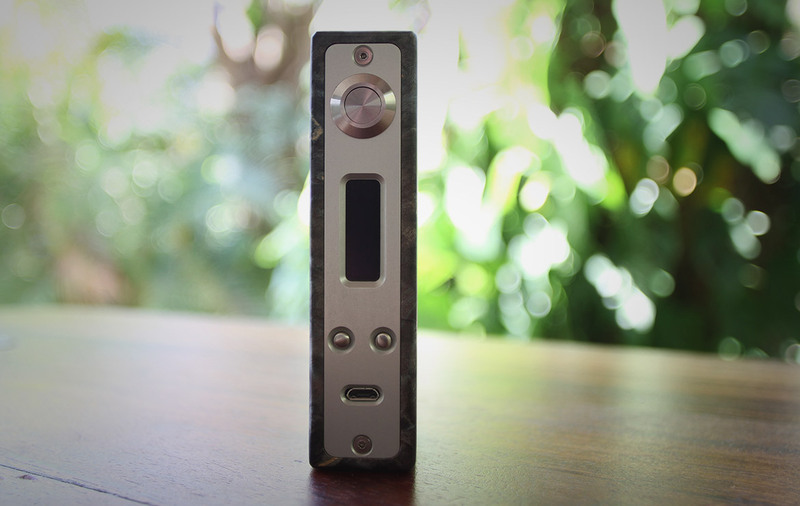 If you are in the market for a high-end mod you need to at the very least check out the M17. We love what Axis is trying to do and think they are doing an awesome job at making the high-end market more accessible. Hopefully more moders/manufacturers will follow suit. I’m sorry to hear about your trouble. I think you should try to have another contact with them, I hope that was just a single bad experience. Always good to give second chances.